iPhone – Boon to Admob? Last year, I wrote an entry which looked at AdMob’s monthly Mobile Metrics report and concluded that smart phone platforms from Nokia, RIM and Windows Mobile had a higher share of ads served compared to that of Apple’s iPhone. I pointed out that this was not consistent with the browsing market share numbers reported by Net Applications. Well, iPhone has addressed that discrepancy to leave absolutely no doubt whatsover! Just take a look at the March 2009 report from AdMob (left). I have included the March 2008 report (right) as well for easy comparison. The iPhone and iPod Touch together have a 22% share (more than the rest of the 18 platforms listed in the table) of the 7.65B ad requests made to AdMob – the distant third is the Motorola RAZR platform with a 2.7% share. 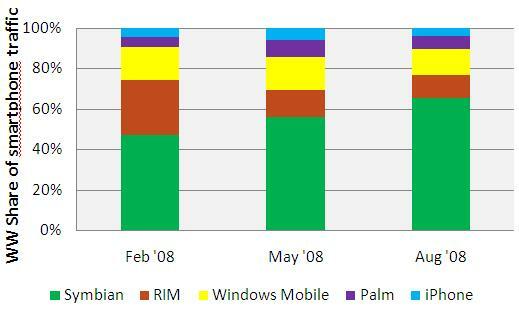 Contrast this with March 2008 when the RAZR platform had a 5.6% share of ~2.86B ad requests. It is clear that the phenomenal success of Apple’s AppStore has a lot to do with the dominance of the Apple platforms. In fact, AdMob reports that applications have had a big impact on the growth of mobile data usage. According to AdMob, in March 2009, more than half of the total number of ad requests for the iPhone came from applications. It is clear that applications (especially the free variety) provide a tremendous opportunity to drive mobile advertising and will benefit ad networks such as AdMob. With regards to the iPhone question: we serve ads on our partner’s mobile sites, so when the users surf the “regular” web on the iPhone that traffic isn’t included in the Metrics report. Much of the tremendous growth we are seeing in iPhone requests are coming from the creation of iPhone specific mobile sites. This traffic is included in the report and these sites represent a growing part of AdMob’s business. As content owners look to improve the mobile experience, we believe more and more mobile specific sites will be created and the mobile web will continue its strong growth in the face of more handsets having the ability to surf the “regular” web. One additional point of clarification – the report doesn’t state that a Motorola RAZR user is more likely to surf the mobile web that an iPhone user, it simply states that our publisher sites see more traffic from RAZRs than iPhones. The mobile web existed and was seeing explosive growth well before the iPhone hit the scene –many millions of these devices are still in heavy use today. The short answer is that regular web-surfing (which is what most iPhone users do, I reckon) is not included in AdMob’s report. The AdMob-reported iPhone numbers refer to ads served out by AdMob when users visit iPhone specific mobile sites. According to AdMob’s September report, iPhone is giving the other platforms a run for their money even here! 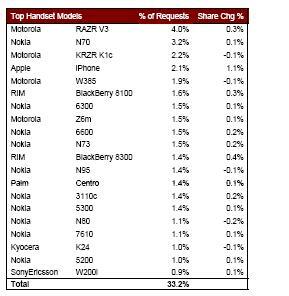 iPhone is now ranked 4th globally in terms of the total number of ad requests served by AdMob -ahead of Nokia N95/N80/N73, BlackBerry 8100/8300 and Pal Centro. 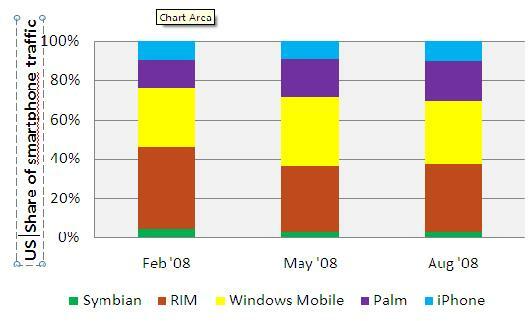 Only Motorola’s RAZR/KRZR and Nokia N70 is ahead and not by much.